Friday April 13th 1923 It rained in the night and all day, so I could not get out at all. Visited and rested in afternoon. 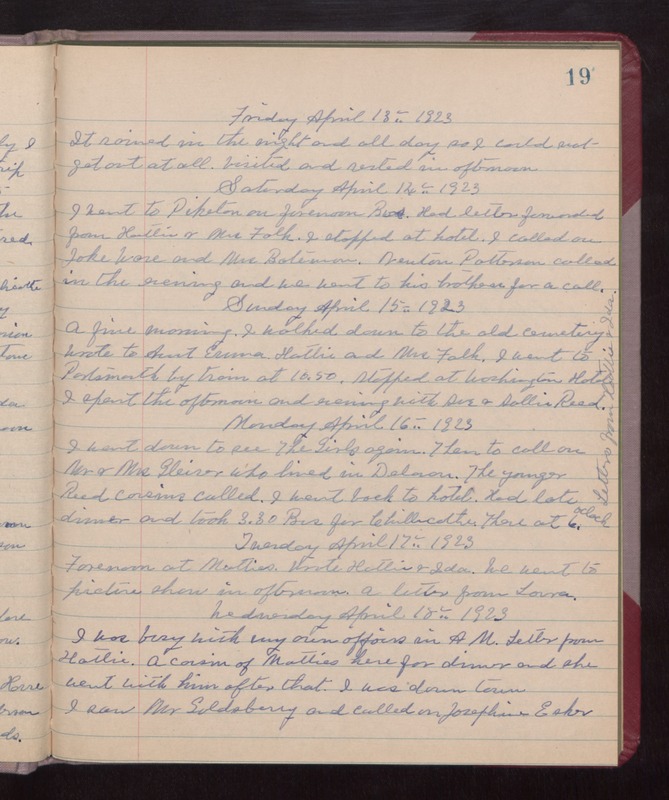 Saturday April 14th 1923 I went to Piketon on forenoon Bus. Had letter forwarded from Hattie & Mrs Falk. I stopped at hotel. I called on Jake Ware and Mrs Bateman. Newton Patterson called in the evening and we went to his brothers for a call. Sunday April 15th 1923 A fine morning. I walked down to the old cemetery. Wrote to Aunt Emma. Hattie and Mrs Falk, I went to Portsmouth by train at 10.50. Stopped at Washington Hotel. I spent the afternoon and evening with Sue & Sallie Reed. Monday April 16th 1923 I went down to see The Girls again. Then to call on Mr & Mrs Gleiver who lived in Delavan. The younger Reed cousins called. I went back to hotel. Had late dinner and took 3.30 Bus for Chillicothe. There at 6 oclock. Letters from Hattie & Ida. Tuesday April 17th 1923 Forenoon at Matties. Wrote Hattie & Ida. We went to picture show in afternoon. A letter from Laura. Wednesday April 18th 1923 I was busy with my own affairs in AM. Letter from Hattie. A cousin of Matties here for dinner and she went with him after that. I was down town. I saw Mr Goldsberry and called on Josephine Esker.